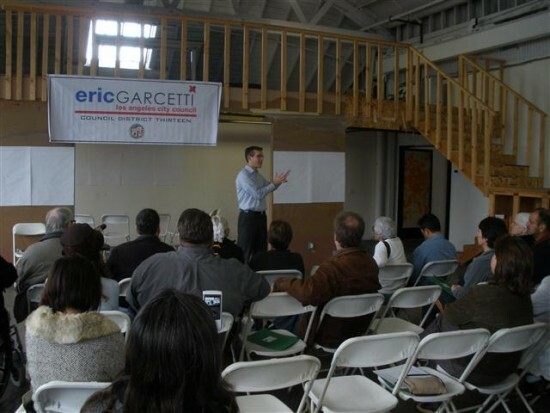 I spent my overcast Saturday afternoon with about 30 others in Atwater Village attending L.A. City Council President Eric Garcetti’s LAND (Los Angeles Neighborhood Dreams Initiative) visioning workshop at Atwater Crossing. I previously attended the Hollywood LAND workshop back in late January, but I wanted to attend this one for several reasons — I especially wanted to compare and contrast how different communities gauge their visions and needs. I do consider myself an Atwater Village stakeholder — My chiropractor is on Glendale Blvd, I have several friends who live in the neighborhood whom I visit, I have friends who own or used to own businesses in Atwater Village, I occasionally do freelance outreach work for The Robert Group, and was even a victim of crime in the area — I was mugged at gunpoint on Glendale Blvd in August 2001 (I was not physically hurt, thankfully). According to the L.A. Times’ Mapping L.A. profile of the neighborhood, Atwater Village is a 1.75-square mile, eggplant-shaped area nestled between the Los Angeles River and the Union Pacific/Metrolink railroad tracks, with mostly the city of Glendale on the other side (Glassell Park is across the tracks in the southern end). Boasting over 15,000 residents, its ethnic mix is roughly 50 percent Latino, 22 percent white and 20 percent Asian (mostly Filipino). 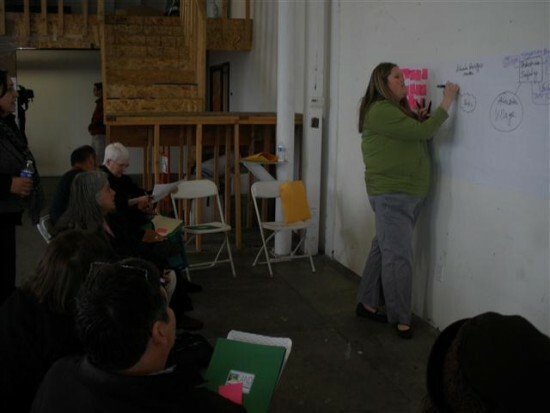 As typical with most community-involvement events, the nearly 30 people who attended Saturday’s workshop didn’t exactly match those percentages. Not including the councilman and his staff, the attendees were nearly all white, with a few Latinos and another Asian (also Filipino) besides myself. Most of the people who did attend were people who were already in tune to the neighborhood goings-on. There were several board members of the Atwater Village Neighborhood Council present (Would that warrant a Brown Act violation? Not sure…), Several representatives of the local business community and chamber of commerce, a teacher from Atwater Elementary, and other actively-concerned residents and stakeholders. CD13 field deputy Angela Motta facilitates our group. 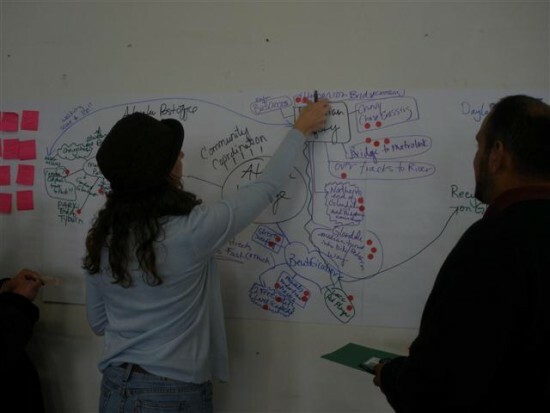 The format was the same as the Hollywood workshop – Garcetti spoke about the LAND process, we were split up into groups (there were three here) and each group was asked by a facilitator to provide neighborhood assets, needs and priorities. Our group was facilitated by CD13 field deputy Angela Motta, who incidentally also handles Atwater Village for the council office (as well as Hollywood). Participants mark with stickers priority needs in the community. For me the “needs” section was the most interesting part. A neighborhood that describes itself as “quaint” and with a “small town feel” in general seeks to merely enhance or protect what it already has; there are few, if any “radical change” needs requested here. Most of the needs dealt with pedestrian safety, beautification, river/park recreation enhancements and small business improvements. From my outsider point of view, Atwater Village doesn’t have the same issues East Hollywood has: lack of park space, graffiti/gang presence, blight, lack of residential parking and rising residential and commercial rents. I brought up a need for the community to have a pedestrian bridge directly serve the Glendale Metrolink station so that Atwater Villagers can have increased access to existing regional rail transit, which several others in my group agreed. I also brought up the need for the northern end of Glendale Blvd to be as pedestrian-friendly as the southern end, citing my mugging incident in the slightly less-commercial northern end as an example. Others in the group had very interesting ideas. Ava Bromberg, project director of Atwater Crossing, brought up a lot of transformative planning-related concepts: Eliminating or shrinking the Glendale Blvd median so that sidewalks can be widened and bike lanes could be added to the corridor; adding murals to the sloping concrete abutments under the railroad tracks at Los Feliz, Glendale and Fletcher; capping the railroad underpass along Fletcher and replacing it with an overpass, allowing Casitas Avenue to continue. Other ideas dealth with increasing pedestrian safety on the Hyperion Bridge (especially for Marshall High School students), increasing access to the river, to Glendale and to Griffith Park, and converting various small parcels into park space. 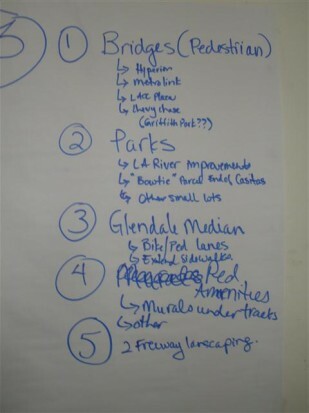 Beautifying the Glendale Freeway easement was also brought up. Visiting Group 3, Garcetti takes notes. 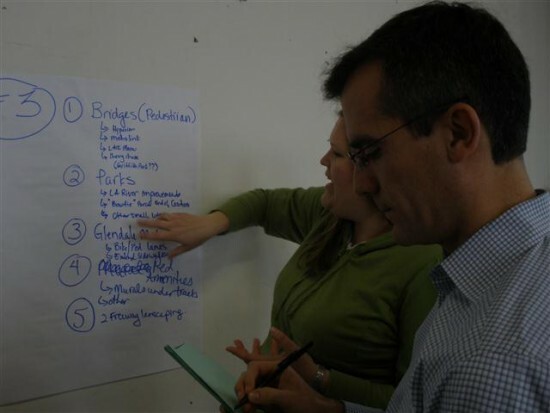 Garcetti summarized the workshop’s collective needs into six general areas: Connections and connectivity, attracting neighborhood businesses, transportation/walkability, L.A. River-related issues, beautification needs and various community-group and planning requests. At the beginning, one participant questioned the councilman’s purpose of organizing this event, saying, “Why should we trust you…the City is broke!” Garcetti replied, in short, that funding is out there, we just have to look through different sources and think and act creatively. He talked about the recent Clean and Connected Communities grant for small beautification projects around the district and how funds were able to be acquired for that. On that note, some of these projects are totally doable, such as the pedestrian bridge to the Glendale Metrolink station across the tracks, which can likely be built mostly with federal transit administration funds rather than City or county money. During the event, I got to chat with board members of the AVNC such as Cindy Marie Jenkins, Bruce Fleenor (who recognized me as one of the EHNC members who came to their meeting to speak in support of the Cyclist’s Bill of Rights) and Robert Smith. I even gave them all “I Love East Hollywood” bumper stickers as a goodwill offering, which they were already aware were inspired by their own neighborhood council’s stickers. After the LAND workshop, I took a long walk around Atwater Village, enjoying a sandwich from Vince’s Market, walking by attractive native plant gardens on front yards, and even returning to the fateful spot on Glendale Blvd where I was surrounded by eight dudes at gun- and knife- point on a Summer’s night a decade ago and gave them everything I had. Even despite that, I still had some envy for this neighborhood — after all they still have a Foster’s Freeze (I have fond childhood memories of the one at the end of my block, which was taken away by development nearly 30 years ago)! I’ve always thought of Atwater Village as a neighborhood that’s relatively well-to-do with regard to basic quality of life issues. But the biggest thing I learned from today is that no matter how good a neighborhood is or looks, there’s no end to community needs.